Secure access to your claim status and safety tools. myResource is the workers’ compensation portal to your company-specific policy information. 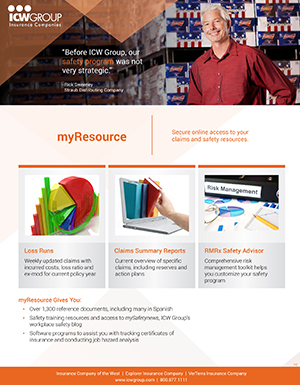 With myResource, you can develop a culture of safety and take a proactive approach to managing claim costs. Loss Run Reports* – for your current policy term, updated weekly. Claim Summary Reports* – updated on an ongoing basis. RMRx Safety Advisor – online suite of customizable safety tools. Request myResource accounts for your team today! For more information, visit the Policyholder Center, myResource. You can also view the Welcome to myResource brochure and use our Contact Us page to find your local risk management consultant. * Note: Due to the confidential nature of Loss Reports and Claim Summaries, an Owner or Officer of the company will need to provide authorization for this access. Refer to the Work Comp Policyholder Center, myResource Terms and Conditions of Use.